Human embryonic stem cells (hESCs) have the potential to differentiate into all cells of the three germ layers, thus making them an attractive source of cells for use in regenerative medicine. The greatest challenge lies in regulating the differentiation of hESCs into specific cell lineages by both intrinsic and extrinsic factors. In this study we determined the effect of a fibroblast-derived extracellular matrix (fd-ECM) on hESCs differentiation. We demonstrate that growth of hESCs on fd-ECM results in hESCs losing their stemness and proliferation potential. 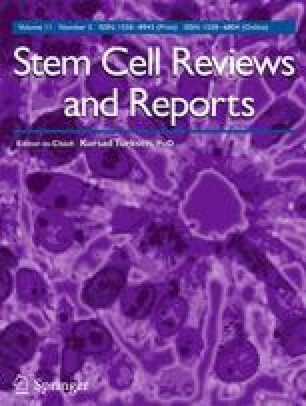 As the stem cells differentiate they attain gene expression profiles similar to the primitive streak of the in vivo embryo. The activation of both the MEK-ERK and Wnt/β-catenin signaling pathways is required for the fd-ECM-mediated differentiation of hESCs towards the endoderm and involves integrins α1, α2, α3 and β1. This study illustrates the importance of the cellular microenvironment in directing stem cell fate and that the nature and composition of the extracellular matrix is a crucial determining factor. The online version of this article (doi: 10.1007/s12015-015-9598-4) contains supplementary material, which is available to authorized users. This work was supported by the International Centre for Genetic Engineering and Biotechnology (ICGEB), the South African Medical Research Council and the University of Cape Town. The funders had no role in the conduct of the research or the preparation of the manuscript.